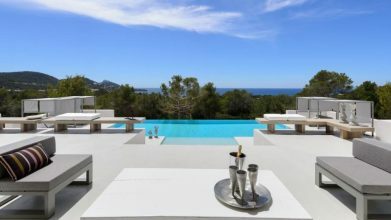 Impressive and spacious manor house located in the countryside near the city of Ibiza. The main house has 6 bedrooms and 6 bathrooms. The guest house with 2 bedrooms and 2 bathrooms. The domestic service house 2 bedrooms and 1 bathroom. The property is of recent construction with high quality materials and all the necessary modern equipment. The garden is planted with olive trees and palm trees and the large lawn frames the fabulous pool. The adjoining building plot is also for sale. Location: 5km from Ibiza, very quiet.